The game puts you in control of an operating system aboard an alien spaceship called STAVO. Piloting the spaceship is an alien named Zheekei. The alien belongs to the Ayum species from the planet Amayilla. Feed the alien the proper amount of healthy foods for the day so that it has enough energy to pedal it's spaceship back home in one piece. As the controller of the OS (operating system) you must monitor and organize Zheekei's meals for the day, ensuring the alien recieves the proper amount of nutrition (the alien requires the same amount of daily nutrients as a 9-13 year old earth child). This is important because the meals need to give Zheekei enough energy to pedal it's spaceship back to Ayamilla (home planet). Feeding too little will fail to give Zheekei the proper amount of energy to pedal home. Feeding too much will send the spaceship flying past the target. The proper balance of nutrients is needed to see the spaceship land safely home. As the controller, if you feel you didn't organize the proper meal (or you fed the alien too much) you can command the alien to excercise in order to burn off the calories and start over again before setting course for home. The game menu includes ingredients found on earth that fit the USDA food groups and requirements. Foods can be mixed and matched to make special dishes that provide Zheekei with a healthy diet. 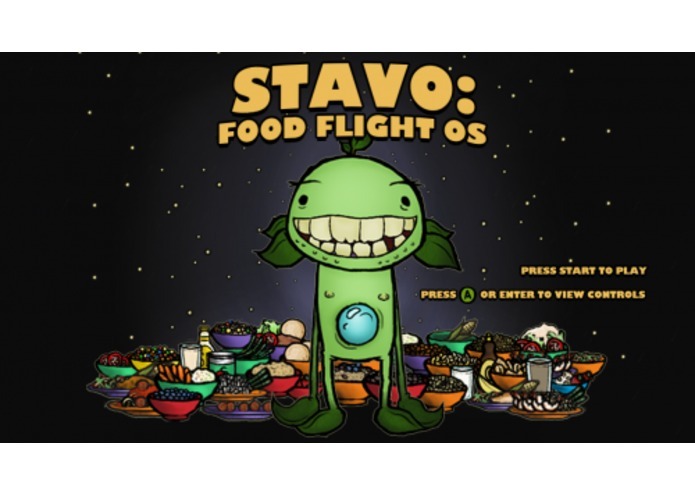 STAVO: Food Flight OS is a unique and creative game designed to get children engaged and learn about nutrition. The game is both fun and educational. This is an XNA game that needs certain requirements to run. This submission is the demo version of what will and can be expanded to a deep gaming experience. Expansions include a fully detailed menu, additions to excercise options and potential for fun minigames to make the experience even more entertaining. Different parts of the spaceship and even home planet can be opened up for new opportunities in educational gameplay. The game also has the potential to be adapted for real time gameplay, requiring the players to feed the alien during the proper time of day over the course of several days. This version can be played with a keyboard or a proper USB Xbox controller that can be plugged into a PC. The game is not only ready for an online release but is also ready for a release on the Xbox Live arcade and compatible with the Zune as well.